Labor and the Coalition government have now agreed to cut the federal renewable energy target (RET) from 41,000 gigawatt hours in 2020, to 33,000 GWh – a reduction of almost 20%. This agreement has been hailed as restoring stability to the industry, after a year plagued with uncertainty and featuring two reviews. However, this is still a significant cut, particularly as the target is a significant part of Australia’s policy response to climate change. Meanwhile, Victoria has committed to restoring its own renewable energy target, the VRET, following other states in developing renewable energy policy. However a clause the federal legislation prevents schemes similar to the federal RET. How can the states get around this and support their industries? Australia’s RET began in 2001 with the Mandatory RET of 9,500 GWh of renewable energy generation by 2020. In 2004 the Howard government rejected the Tambling review recommendations to increase the target. 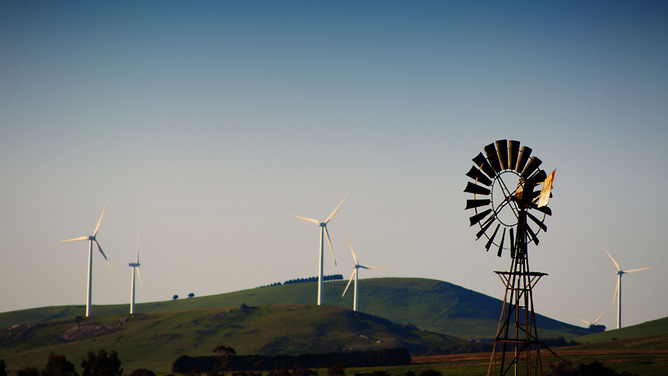 Following this decision, with a fledgling renewable energy industry threatening to fold, Victoria, NSW and SA all announced their own renewable energy targets and support measures. In a case of history repeating itself, several state governments have again announced their own targets. South Australia already had a target for 50% by 2025 and the ACT has a target of 90% by 2020. More recently, Queensland committed to generating 50% of its energy from renewable sources by 2030 and Victoria committed to re-instating a Victorian RET (though no target was specified). Victoria’s Energy Minister, Lily D’Ambrosio recently stated, the revival of the VRET is currently prevented by a clause in the federal RET legislation. The Federal Government must move out of Victoria’s way and change the law. Our state needs a proper renewable energy target, to support the industry and reduce pollution. Like the Australian Capital Territory’s programme, the Victorian government could underwrite the deployment of renewable energy by spending Victorian taxpayer funds. So what can Victoria do? The federal RET relies on tradeable renewable energy certificates to reward generators and require consumers to pay. Section 7c however was “not intended to apply to feed-in tariffs or other support mechanisms”, so schemes that do not rely on tradeable certificates (such as the VRET) are not prevented by the legislation. State action could rely on feed-in-tariff schemes. These have been used successfully to support the small-scale and large-scale renewable energy in Australia and overseas. Tariffs in their traditional form rely on the government to set a guaranteed rate of return for renewable generated electricity fed into the grid. While they provide for investment security, overly generous tariff setting, potentially causing unnecessary costs for consumers, has been a consistent critique of the use of tariffs for renewable energy support. Newer hybridised mechanisms such as contracts-for-difference could provide opportunities for providing cost effective renewable energy support beyond the federal renewable energy target. These contracts combine the best features of tariffs (certainty for project developer) with the best features of certificate schemes (competitively-priced projects). They also allow a suite of technologies to be supported, unlike certificate schemes, which have historically supported only the cheapest technologies (typically onshore wind). The contracts-for-difference act as a “top-up” to revenue streams for renewable generators. The “top-up” is effectively the difference between the required revenue (known as strike price), and the value of the revenue in the current market. If the combination of wholesale prices and certificate prices increase, the top-up required decreases. In fact if prices increase high enough, above the strike price, the project developer would actually pay back the difference. The challenge lies in determining what the strike prices should be. A reverse auction is commonly used to ensure a competitive outcome is maintained. Contracts-for-difference are used in other places around the world, particularly the United Kingdom. There they are being used to support a range of technologies, including wind (both onshore and offshore), solar photovoltaic and nuclear energy. 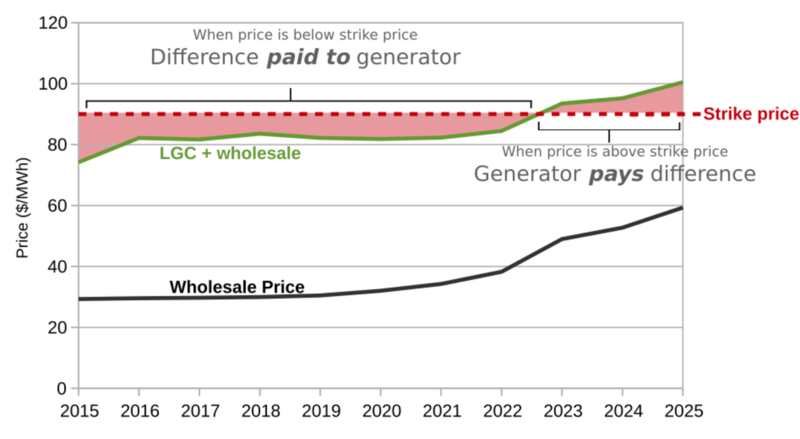 Likewise, the ACT seeks to achieve its ambitious renewable energy target with a tariff that utilises a contract-for-difference approach. The scheme has held two successful auctions to support large-scale solar and wind projects. The ACT scheme is now looking at “next generation solar” (including solar plus storage) in the next round. The cuts to the federal RET provide an opportunity for Victoria and other state government to take on board policy learning in ACT and Europe and support their renewables industry in a competitive way. A revival of the Victorian RET is currently prevented by legal barriers. However, as the examples of other states and overseas show, this need not be an impediment to strong and ambitious state action for renewable energy.